Flat roof problems solved. Period. Welcome to J3 Systems (formerly Lone Mountain Roofing), where we specialize in solving flat roof problems throughout the Albuquerque, New Mexico area. 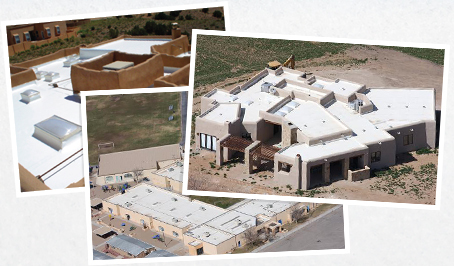 Since 1973, J3 Systems has been helping New Mexicans maintain the value and safety of their homes and businesses by providing secure, leak-proof roofs. In fact, flat roofs are all we do, and we’ve installed thousands of affordable commercial-grade flat roofs for homes and buildings throughout the state. The #1 Commercial and Residential roofing contractor in New Mexico. No one has installed more thermoplastic roofing than us: more than 30 million square feet. Flat roof specialists. Because flat roofs are all we do, we have the expertise to solve any flat roof problem. Experienced, trustworthy roofers. Fully licensed and bonded. Many of our team members have been with us for 10-20 years. Honest service from a local company. Family owned and operated since 1973. Commercial-grade materials. Your home or commercial structure will be protected by the same high-quality, proven roofing system we install on shopping malls, schools, office buildings, and other commercial structures. Where we are: Bosque Farms, New Mexico. Serving Albuquerque and Central New Mexico (from Santa Fe to Socorro, and from Moriarty west to Grants). Our commercial roofing division works statewide. 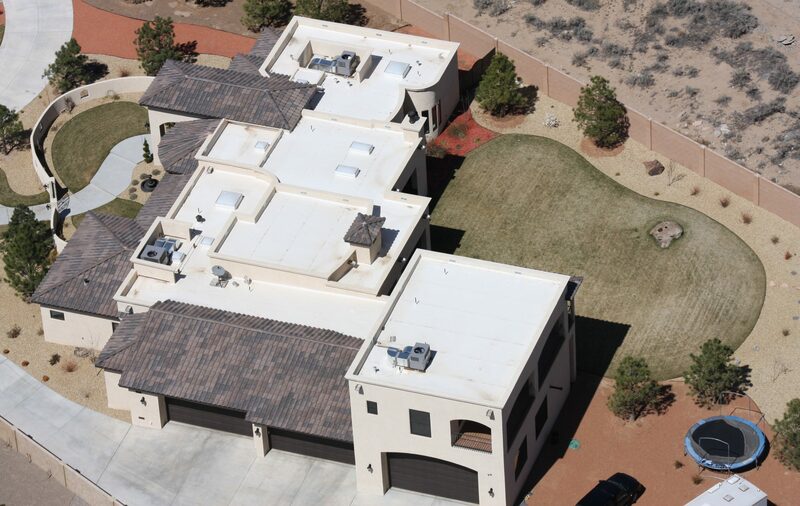 Special areas of expertise: Flat roof specialists for over 30 years, LEED, Energy Star, and exclusive installer of the Lone Mountain Pro-Ply Roofing System – a commercial-grade lightweight single-ply thermoplastic (PVC, KEE, or TPO) membrane roof system. Pro-Ply is an affordable, higher-quality alternative to tar & gravel, rubber (EPDM), foam, modified bitumen torched-down and other flat roof systems. Services we offer: Residential and Commercial new and re-roofing, inspections, preventative maintenance and spot repairs.